A versatile yet safe and reliable disinfectant, ANIGENE HLD4V has many uses in the home to enhance the level of hygiene and significantly reduce the risk of cross-infection between animals and humans. Each day, or before filling, immerse in a solution of ANIGENE HLD4 V at 1:50 (20ml per 1 litre working solution) and rinse under running water before refilling. Change the drinking water regularly. Never simply keep topping up a bowl as germs will linger. 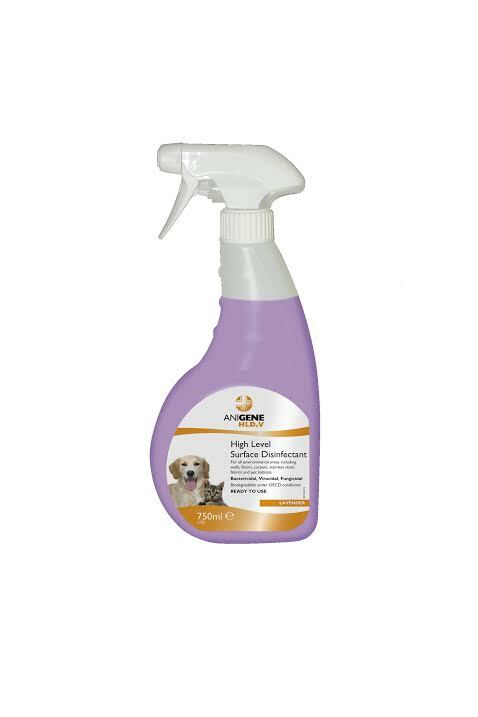 For the cleaning of kennels, hutches and cages use ANIGENE HLD4 V at a 1:50 solution. e.g. 20ml of concentrate for each litre of water used. Use ANIGENE HLD4V for cleaning and disinfecting wicker, stainless steel and plastic cages. Ensure cage or basket is thoroughly dry before installing an animal. Soak bedding in a solution of ANIGENE HLD4V at 1:50 for 20 minutes before washing. ANIGENE HLD4 V should be added to the washing machine at a dilution of 100ml per 4kg load. Wipe down all surfaces (including sinks) and wash floors and walls using ANIGENE HLD4V at 1:50. e.g. 20ml of concentrate for each litre of water used. There are currently no questions for Anigene High Level Surface Fragranced Disinfectant - be the first to ask one!